Rating: Liked a whole lot. Almost love. Did I finish? : You couldn't have stopped me if you tried. One-sentence summary: Childhood fantasy and adult reality collide when a woman and her boyfriend are led to believe they'll be reunited with his sister who disappeared as a child fifteen years ago. Do I like the cover? : YES! How creepy is it?! It's so perfect for the story and is super eye-catching. First line: Hotter than hot, no air-conditioning, sweat pouring down in rivers, the Magic Fingers motel bed vibrating beneath her, Mr. Ice Cream doing his thing above. Did... I actually have problems going to sleep while reading this? YES. The creepy factor is amazing. Best shivery-up-the-back feeling ever. Am... I still talking about this book and chewing over it despite finishing it days ago? : YES. Seriously, the mood setting is just great. Did... this book feel very New England-y to me? : YES, but it might just be that since the author lives in Vermont, I'm convinced I can see the influence -- and I think the setting-as-character is what made the story feel a bit Shirley Jackson-ish to me. Buy, Borrow, or Avoid? : Borrow absolutely but own if you can -- you'll want to lend it out to everyone you meet so you can have people to squeal and gush with about the crazy twists! Why did I get this book? : I think I mistook this book for being straight-up paranormal and so it was a delicious surprise to find it was more of a thriller (literary thriller, according to the back cover blurb). Review: To put it bluntly, I had a great time with this book. Every chapter ended with a literal gasp-out-loud moment, the characters were totally real, and the creepiness of this book insidious and addictive. This was one of the most engrossing seven days I've had with a book in a long while, and the only reason it took me so long to read was that I a) couldn't read it at night without freaking myself out and b) wanted to prolong the pleasure. I hesitate to say much more because the story moves so quickly -- alternating chapters between now and fifteen years ago, leading up to the day when the girl disappears -- and I don't want to give away a thing. I will admit, however, that for a while, the heroine Phoebe and I had a rocky relationship which impeded my enjoyment a smidgen. I found her a bit aggravating and self-destructive and it wasn't until I realized she was displaying some classic ACOA (Adult Child of Alcoholic) behavior that I felt more sympathetic. All the characters in the book felt very real, even the secondary characters, and it was easy to keep track of the cast (not enormous, but large). The writing is so effortless, you race along (thanks to the pacing, too) and the next thing you know, you're halfway through the book and it's getting dark. I think this would be an absolutely perfect read for the summer. McMahon was a new-to-me author so I'm very excited to pick up her other three books -- I feel a summertime fling coming on! 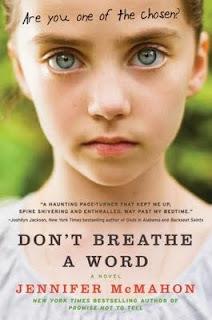 I'm very excited that the publisher is offering a copy of Don't Breathe a Word to a lucky reader! Just comment on this entry with an email (or another way to get a hold of you) to be entered. Closes 6/10, open to US/CA. Please stop by on June 7 for my Q&A with Jennifer McMahon and another chance to enter! I just got this book, and after reading your great review of it, I am super excited about reading it for myself. I love super intense plots and perfectly suspenseful twists, so this is one that I am eager to get started. Fantastic and enticing review! I am so glad you loved this one! I love love love Sarah Dunant so it makes me happy this book brought her to mind! Oh, this one does sound really good! I absolutely love literary thrillers that know how to correctly pace the action. To often all the twists and plot resolution are crammed into the last 30 pages. Great review...I'm definitely adding this one to my list. Thank you so much for the giveaway! This book looks amazing!! This sounds so interesting. And the cover does look bit creepy! Good to hear you liked this. I would love this one to add to my summer reading pile. Thanks! Well, this sounds like a great book, even with the creepiness factor. Definitely want to read this one. Sounds good! This sounds fantastic! Glad to see you loved it. This is on my wish list. I just read Promise Not to Tell a few weeks ago and really enjoyed it. I'd really love to read this. Thanks for the chance! Wow, your review is so engaging -- it almost makes me want to pick this up even though I have a pretty hard and fast rule about staying away from anything involving child abduction or child murder storylines. Have to think about this one. Sounds great! Please count me in. Thanks for the giveaway! This isn't the kind of book I usually read but I was given a copy at BEA last week and your review has convinced me that I really do need to read it. Sounds like a great weekend-getaway-book! I've been reading about this book around the blogosphere and I'm intrigued. I'm not generally into thrillers, but this one sounds good. I like the creepy cover, too. Oh, I LOVE "gasp-out-loud moments"!!! So I would love the chance to read this book. Thanks for another awesome giveaway! Wow, your review leaves me determined to read this book. Thanks for the giveaway. I really enjoyed reading your review and now I want to win and read this book. Thank you for the chance. This book sound creepylicious! My email is Dorwh at aol dot com . Thanks for the giveaway. The storyline sounds like a real page turner and I would love to win and read this book. I'd love to win, no one I know has this book (not even my library) so I can't borrow it. *does a dance* I am SO excited about this book! Good to get to know Jennifer Mcmahon better, the creative voice behind some really good novels. I love "Promise Not to Tell." Great set of twists and turns! Thanks for the info, looking forward to reading this. (love the "creepy" factor....DISMANTLED nailed that really well!) If I win a copy you can find me at greeneking at aol.com or regardez403 at gmail.com.